Graveyard Greg explains in his Foreword how he came to write this novel. Firstly, there was the Second Life virtual-reality world, for which he created a jackal persona with a red Mohawk wearing black jeans and red sunglasses. Secondly, there was his brief job as a barista at a Starbucks. Thirdly, there was John “The Gneech” Robey’s series Fictionlets: The Extremely Brief Adventures of Bridgid and Greg, each of 400 words or less. Fourthly, there was his own imagination, which blended them together, named his jackal Venti and gave him a job as a part-time barista at a Starbucks clone, and he was off and running in a series of short-short-short chapters of one page or slightly over each. Voilà; Welcome to Cappuccinos! (exclamation point optional). FurPlanet Productions, January 2012, trade paperback $19.95 (246 pages). Illustrated by Mitternacht. Venti is a jackal; nine feet three inches tall, incredibly ripped, and gay. His co-worker Damon is a bear; ten years younger and also gay. In fact, this Cappuccinos Coffee House (with a water-horse kelpie logo) in Reno is a regular gay hangout; not with any outright eroticism, but just studly guys hanging out together and trading gay innuendos. When they’re not at the java joint, they’re working out at Max’s nearby Ironhorse Gym. “They” are Art the lion. Haavard the dog. Otis the otter. Adrian, a frog. (“Frogger!”) Max, a stallion. Collin the wolf. Charles, another bear. Blair the badger with a bad heart. Singa the cheetah who dyes his fur a metallic silver and paints his spots in a rainbow pattern. A crazy nameless old ermine who has invented a gun with Styrofoam bullets. Venti’s hours at Cappuccinos are being cut, so he has a second job – well, source of income – posing in body-building poses that leave nothing to the imagination, if you know what I mean, for a web-cam feed; and is considering a third, real job modeling for an art class. I semi-lied. The cast keeps it inside their pants in public, but get intimate in private. Venti and Damon become gay lovers. When Damon becomes jealous combined with self-consciousness about his “inadequacy” compared to Venti, and leaves, the embittered jackal and his buddies experiment with each other. Venti appreciates their friendship, and finally develops deeper feelings than just friendship with Art. The ultra-short chapters (180 of them in a 246-page book) make this an easy novel to read in bits & pieces rather than at one sitting. It's interesting to note that the publishing of Welcome to Cappuccinos was made possible by appealing for sponsors on kickstarter.com. 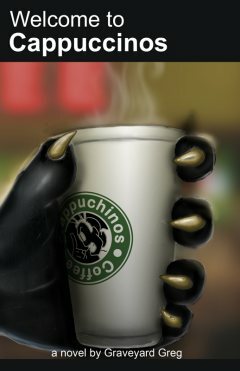 If this is the same work that was originally posted as the "Welcome to Frappuchinos" series on FA, a good portion of it was first written in response to the weekly Thursday Prompts, so that might also help explain the brief, episodic nature of the chapters.